The funeral of an RAF serviceman from Leicester who was killed in Iraq has taken place. 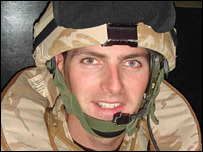 Senior aircraftsman Chris Dunsmore, 29, from the 504 Squadron Royal Auxiliary Air Force, died when militia attacked a base at Basra airport on 19 July. The funeral took place at St Andrew's Church in Leicester Forest East at about 1030 BST on Wednesday. Two fellow RAF servicemen also died in the attack, bringing the total number of armed forces deaths in Iraq to 162. Matthew Caulwell, 22, of Birmingham, and Peter McFerran, 24, of Flintshire, were both senior aircraftsmen in 1 Squadron RAF Regiment. All three had been on a break from duties at a base in Basra when it was hit. SAC Dunsmore, who had been engaged to be married, was a manager in a paint company until he was attached to 1 Squadron in August last year for one year's service. His commanding officer, Squadron Leader Jason Sutton said: "Our auxiliary colleagues fill vital roles on the squadron, and none more so than Chris. "He was a highly skilled individual and from the very start of his time with us he put 100% into everything he did." The 504 Squadron Royal Auxiliary Air Force is based at RAF Cottesmore in Rutland.